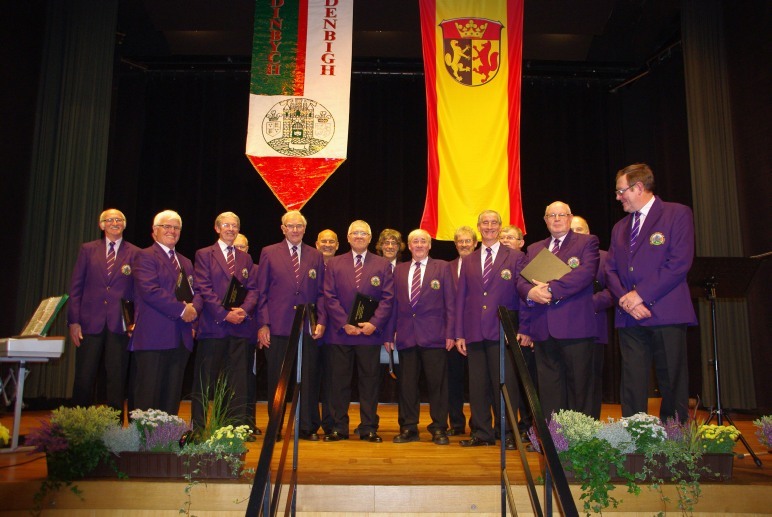 A Double Celebration takes place in Biebertal where the choir were guests of honour. 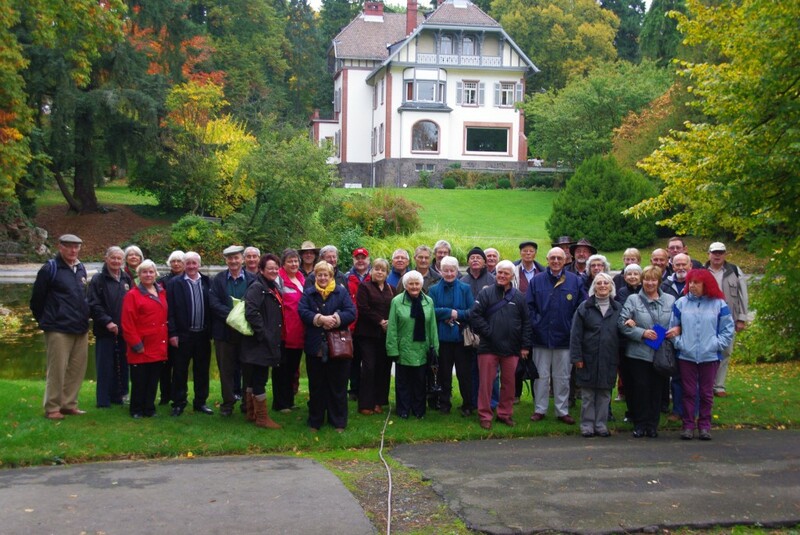 On October 10 2013, members of the choir set off for a long awaited visit to Denbigh’s twin town of Biebertal. The German group were celebrating the 25th anniversary of founding of their twinning association. They had invited the choir to be their special guests at the event. The choir has always been a firm favourite of the people of Biebertal. 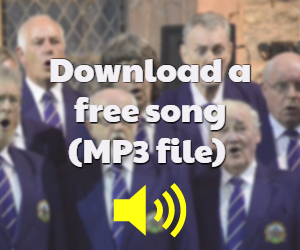 The choir has entertained them on many occasions. After a pleasant flight from Manchester we received a warm welcome in the airport. The Welsh flag held aloft by Jurgen Gaidies who, over the years, learned to speak some Welsh. The transfer to Biebertal by coach took in some beautiful countryside. The woodlands of indigenous trees were just beginning to change to their autumn colours. Deep red and bright yellow foliage looked quite stunning. Greeted by our hosts and taken to the hotel, where some of the party had opted to stay, for dinner. Those who were staying in the homes of our hosts went to their respective houses for a good night’s sleep. A full programme was ready. The following morning we went to Gail’sche Park on a guided tour. Established in the 19th century by a wealthy businessman. It had become rundown and derelict. Restoration carried out over several years by many volunteers. It is now approaching its former glory. After a warming bowl of tasty soup and some drinks we then had a short tour of an engineering factory. Owned by one of our hosts, it manufactured small metal parts. For all sorts of products, from cars to cameras all over the world. From here we went to the ancient church and given a brief account of its history. Then we paid a visit to the small museum, exhibiting items relating to the heritage of the area. Then some delicious home-made cakes and tea or coffee at the house of one of our hosts, Karin. The choir members, unfortunately, had to leave the party to rehearse in a local tavern. Here we met Manfred. He was to be our accompanist at the concert, as our own accompanist Joyce Davies, had not been able to travel with us. Despite the difficulties with communication, as he spoke only a little English. Arwyn Roberts, our choir conductor, speaks even less German. The rehearsal went well. A buffet supper prepared by our hosts followed. After which we had an informal noson lawen (merry evening). 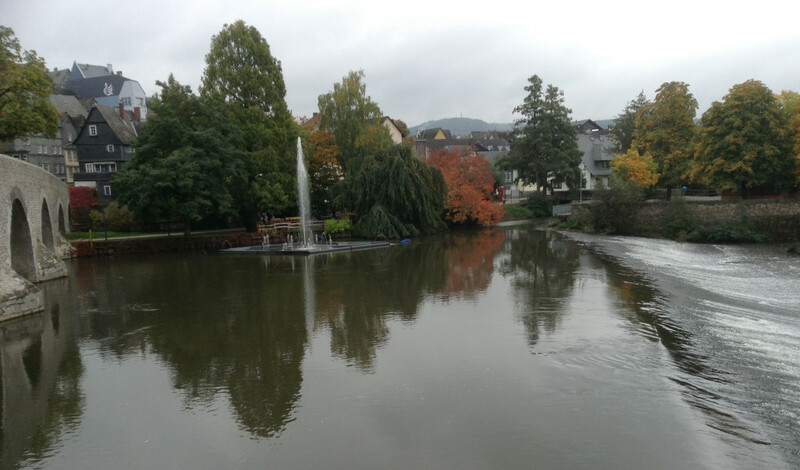 On Saturday we went by coach to a historic city called Wetzlar. Its well preserved medieval buildings and unique ‘Dom’ (Cathedral) dominating the square. The church used by Catholics and Protestants since the Reformation. It had two altars from which services were held, at different times, for both religions. On our return to Biebertal we had a brief period of relaxation. A rest before the main event which was the celebration concert. The well attended event took place in the magnificent large community hall. Many speeches and presentations given. We were the main guests of honour. Despite being fewer in numbers, we performed a variety of pieces to rapturous applause. There was also a solo by Peter Davies. He and Arwyn gave a humorous rendition of ‘The Two Gendarmes’ which was much enjoyed. Gwyn Williams had come along as a guest on the trip, sang two yodelling songs to the great delight of the audience. Gwyn has since decided to join the choir and become a full member. Further entertainment Two local choirs provided further entertainment . The ‘Sing and Swing’ ladies choir, and the Eintracht 1863 Rodheim Bieber Musical Society. The evening ended with some dancing. It was thoroughly enjoyed by all. The following morning we said ‘Auf Wiedersehen’ to our hosts. They had been so welcoming and given us a trip to remember for a long time. Some Biebertal twinning members are coming to the choir’s 25th Anniversary concert in November. Clwyd spent most of his working life in mental health nursing and since retiring has been involved in many voluntary and community organisations. He was one of the founding members of the choir and has thoroughly enjoyed the friendship, cameraderie and singing with a diverse group of people who give so much time and enjoyment to others. thanks Clwyd. Good to have all the names as a reminder for when we see them all again.